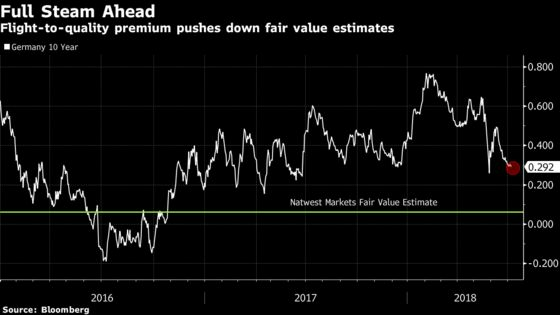 (Bloomberg) -- It’s time to double down and add to long positions in 10-year German bunds, which offer the best risk-reward trade in the world, according to NatWest Markets Plc. Fair value for 10-year German bond yields has halved to an estimated 0.06 percent, more than 20 basis points below current levels, according to strategists Andrew Roberts and Giles Gale. The reasons to buy remain plentiful, they wrote in a July 6 report. Firstly, positioning: no-one is long and everyone is short. Secondly, the European Central Bank continues to support markets, offering long-term guidance as to the next policy steps. Thirdly, the amount of free float available in German securities will continue to shrink as the ECB’s asset-purchase program continues. Lastly, the increased risk in Italian bonds has pushed up the flight-to-quality premium for bunds by as much as 40 basis points, even though core inflation in Europe remains low. Bunds also have positive carry, offering five basis points over a three-month period, and would stand to gain if risks worsen, according to NatWest. “Base case we make profits. On risk cases we make a lot more," the strategists wrote.